It’s 2017, and Rollerblade®, the iconic brand of inline skating, is back. Under the direction of Yann Guyader, multiple World Inline Cup winner, a new team has been built up with a strong foundation supporting it. The Rollerblade® Speed Team will compete in several marathons taking place in Europe, Asia and the United States. The Rollerblade® Speed Team was once one of the best inline speed skating teams in the world. Their success reigned from the 1990’s through the early 2000’s. World champions and WIC champions such as Chad Hedrik, Dereck Downing, Tony Muse, Jorge Botero, Arnaud Gicquel, Diego Rosero, Alexis Contin, Shane and Kalon Dobbin to name several, have proudly competed for Rollerblade® in the past. 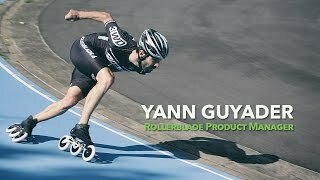 In 2016, Yann Guyader, the current product manager for Rollerblade®, brought a challenge to his close teammate, Jorge Botero. In the name of good-spirited competition, these two icons raced a few marathons, and had a great time doing it. Guyader finished second and Botero third at the North Shore Inline Marathon in Duluth, Minnesota. They finished fourth and fortieth respectively at the biggest marathon of the world, the Berlin Marathon. Guyader went on to finish fourth in Jeonju and sixth in Dijon. These two are really pushing themselves to get out there and race and have fun doing it. In 2017, Rollerblade® will take this experience to the next level. Guyader has grown his team to include two strong French skaters, Guillaume De Mallevoue and Quentin Giraudeau along with the young and fast Venezuelan, Sebastian Paredes. Together they will take part in some marathons in Spain (Valencia, Pamplona), in Italy (Treviso), in France (Dijon), in South Korea (Jeonju), in the USA (North Shore Inline Marathon) and of course in Germany (Berlin). Be sure to follow the Rollerblade® Speed Team to see how the 2017 season progresses! Yann is one of the most successful and experienced speed skaters ever. Several times he has won the biggest cups and marathons in the world. He is a quick and clever racer; able to win in a break away or in a sprint. He embodies what it is to be a professional athlete who works hard to achieve great success, but also one who gifted with natural talent. Guillaume is currently one of the strongest speed skaters in the world. He has won the P2P in Spain three times. This event is sometimes called the most challenging marathon in the world. When he escapes the pack, chances are slim you will ever catch him. If you find yourself racing him, good luck. His speed and endurance are amazing! It was thrilling to see Sebastian as he won a series of World Champion titles while he was the national selection as a Junior. The Venezuelian is fast as lightning and pushes his limits even as he crossess the finish line. With Sebastian, the race is never finished until the line has been crossed. There is no letting up; no cruising to the finish. As one of our youngest team members, you can be sure to see him racing for many years. Quentin is another young gun who represents the future of speed skating. The Frenchman has won everything possible in the young racing categories. Now he is focusing in on the Seniors. Quentin has many qualities that contribute to his successful racing career: he is strong, fast, calm, and has a perseverance that can wear down any competitor. He will definitely be one of the main competitors of the 2017 season. Aura is young, talented, and gold covered already. At the age of 21, she won many marathons in Spain and even got a fourth place in Berlin, the biggest race of the world. The Colombian targets the best results for the coming season and surely, she will get them. Vincent is the team manager. He was part of the Rollerblade family in the 2000’s and comes back home for this new adventure. As a competitor, he achieved many good results: he won three world championship titles as a Master and the London Marathon in 2016 for example. 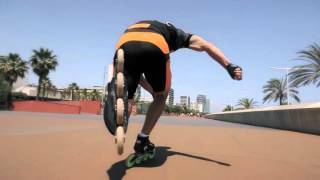 Jorge has been a Rollerblade ambassador for many years now. He was part of one of the first Rollerblade World Team in the late 90’s/early 2000’s. Under the colours of the brand, he won every possible race (many marathons and world titles). His skating is technical and powerful and believe it, he is still able to give a lot in a race!